The dawn of the first stars, galaxies and black holes signaled a fundamental milestone in our Universe?s evolution: the Epoch of Reionization. The light from these galactic ancestors began spreading out, ionizing virtually every atom in existence. Our Universe transitioned from darkness to light, from cold to hot, from simple and boring to the wondrous cosmic zoo we see around us today. Despite its importance, observations of reionization have been few, and their interpretation has been highly controversial. Fortunately, this is rapidly changing. We will soon enter the "Big Data? era of this mysterious epoch, driven by an upcoming wave of observations with state-of-the-art telescopes as well as new sophisticated analysis tools. The aim of this volume is to summarize the current status and future outlook of the reionization field. We bring together leading experts in many sub-disciplines, highlighting the measurements that will illuminate our understanding of reionization and the cosmic dawn: (i) 21cm interferometry; (ii) high-redshift quasar spectra; (iii) high-redshift galaxy surveys; (iv) primary and secondary anisotropies of the Cosmic Microwave Background; (v) high-resolution studies of the metal content of early galaxies. We seek a roadmap to interpreting the wealth of upcoming observations. What is the best use of limited observational resources? How do we develop theoretical tools tailored for each observation? Ultimately, what will we learn about the epoch of reionization and our galactic ancestors? 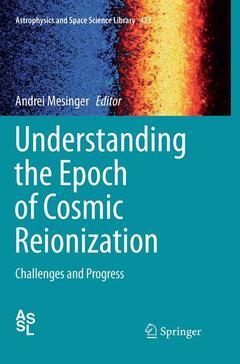 Chapter 1: Cosmic Reionization and the First Nonlinear Structures in the Universe, Zolt´an Haiman.- Chapter 2: Physics of the Intergalactic Medium during the Epoch of Reionization, Adam Lidz.- Chapter 3: Quasars as Probes of Cosmological Reionization, Daniel J. Mortlock.- Chapter 4: Observing the Epoch of Reionization with the Cosmic Microwave Background, Christian L. Reichardt.- Chapter 5: The 21-cm Line as a Probe of Reionization, Steven R. Furlanetto.- Chapter 6: Constraining Reionization with Lya Emitting Galaxies, Mark Dijkstra.- Chapter 7: Metal Enrichment in the Reionization Epoch, Andrea Ferrara. Andrei Mesinger is a Junior Professor at Scuola Normale Superiore of Pisa who received his PhD at Columbia. Dr. Mesinger was a Hubble Postdoctoral Fellow at the Princeton University Department of Astrophysical Sciences and a Postdoctoral Fellow at the Physics Departments of Yale University and UCLA. His research interests are first light, reionization, high-redshift sources, and modeling techniques.